Whether any of us want to admit it or not, back to school is coming. For some of us, it’s here… and we can certainly smell the scent of freshly sharpened pencils. That smells makes any teacher just jump with joy, right? (Maybe during the middle of the school year, not so much during the back to school rush, am I right?!). For others of us, don’t tell me you haven’t been scoping out the back to school aisles at Target! I’ve seen your Instagram posts… I know! I’m super excited to start back, but I am not looking forward to waking up early. I am a morning person, but more of a 7-8am morning person… certainly not a 5-530am morning person. Yuck! Slowly but surely, I’ve been getting things created and printed out for my new classroom. 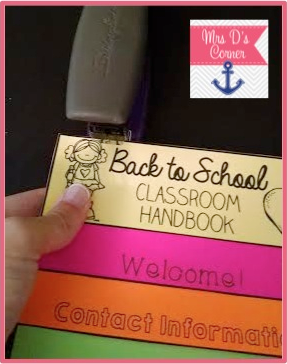 Knowing that I really want to get parents involved this school year, I needed something for Open House/Back to School Night that the parents could take home and have information at their fingertips. Something interactive and something memorable that parents won’t forget. So the first step was editing the flipbook so I could tell parents everything. 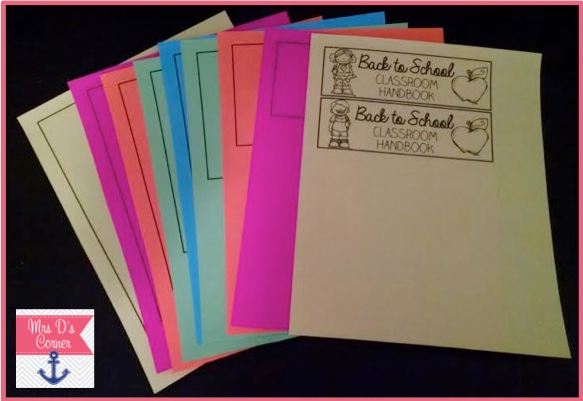 Then I started printing the classroom flipbook. I decided to use colored Astrobrights paper to make each tab stand out on it’s own. I created a pattern with the paper before putting it into the printer, that way when I put it together it would look right. You can easily do this in a school copier as well. I printed them out and the pattern actually worked in my favor. Printer – 0, Mrs. D – 1. I put the handbook in order and stapled it in 3 places: 1 on each end and once in the middle. It’s super simple and really easy to not mess up. I was so proud of myself that I showed my mom (who was visiting/staying with us for 3 weeks), and we brainstormed this amazing idea. Why not add a sticky magnet to the back and the parents can hang it on the fridge?! Brilliant! Now my parents will have access to classroom information on a daily basis (as long as they don’t throw it away… which I know that now they won’t). 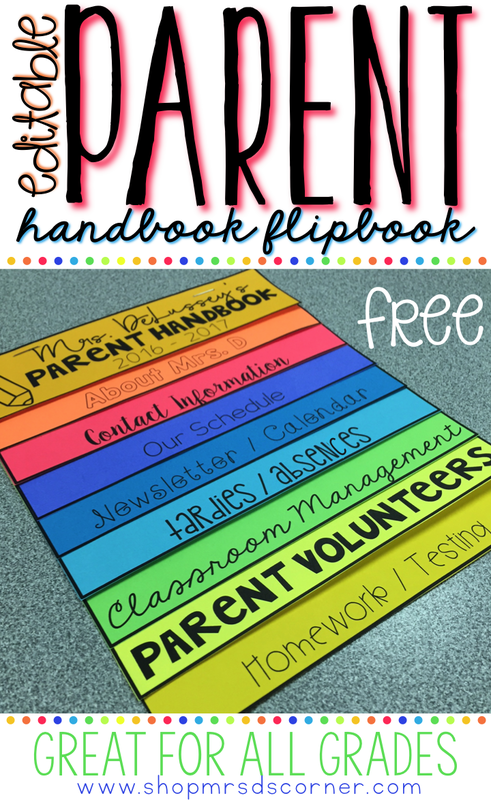 I’m so excited to debut this to my kiddo’s parents! 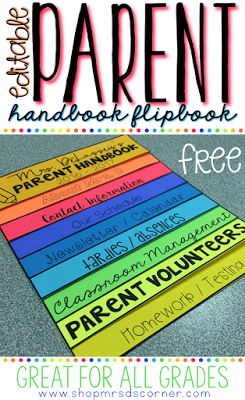 Want to grab this for your classroom? You can pick it up here for FREE! 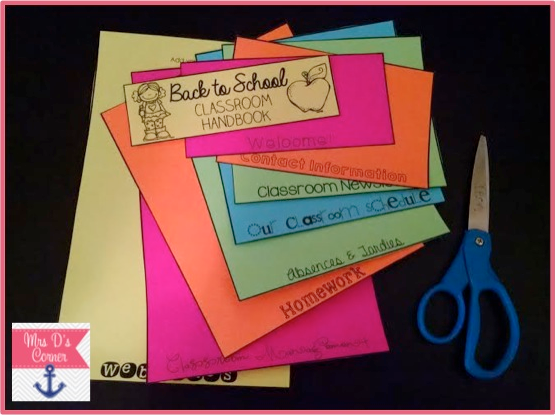 What fun activities or handouts do you have planned for Open House or Back to School Night? Love It!! Very different and unique. 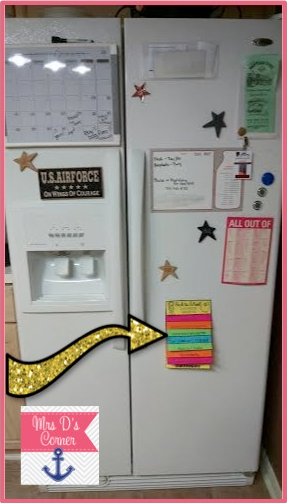 (Well at least from what I've seen) I really like the idea of adding the magnets to place on the refrigerator. 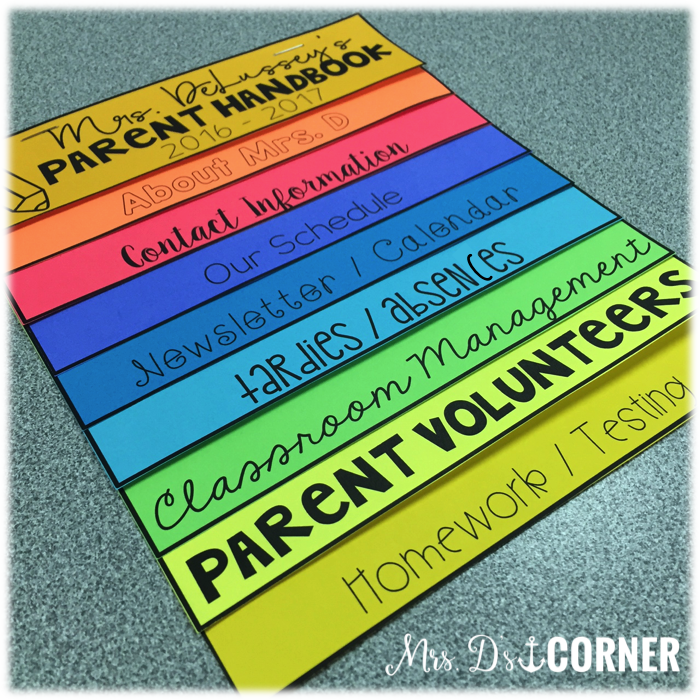 One thing that I would probably add is a calendar of events for class/ school calendar. Thanks for the idea!! Thank you for this. I teach 5-6 special education and this will be a great way to remind them. This is genius, thanks for sharing! 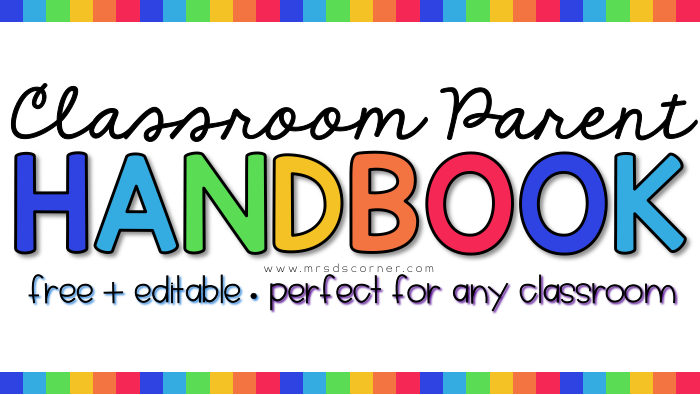 Thanks for sharing this wonderful handbook! I love that it is editable. Where did you find the cute FONTS to go along with this??? I love it!! 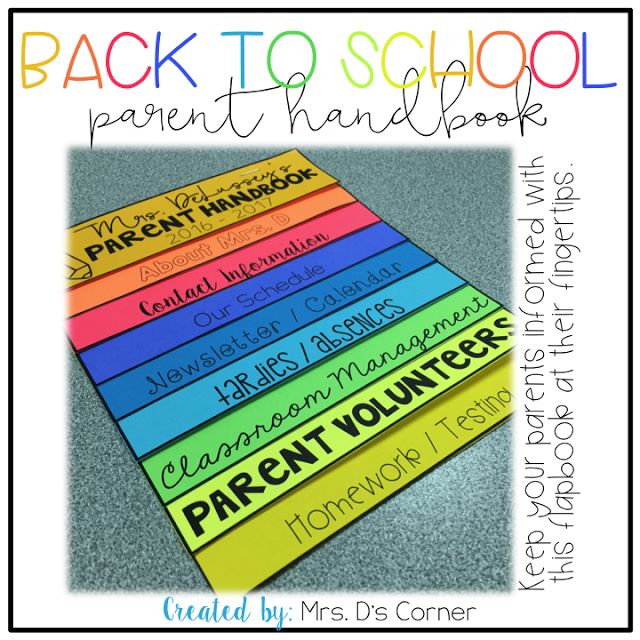 I believe I included the font names in the updated version of this on TPT. If you're looking for other cute fonts, I suggest doing a search on the TeachersPayTeachers website 🙂 You'll find lots of great options there! Thank you! Thank you! My parent's loved this! Amazing! I'd like to create my own for high school, foreign language, or the other courses. Is there a blank template to download and then import or insert what we want to write class specific? I will use in my class.